As we head further and further into winter the glorious summer days filled with sunshine and flowers seem a long way off. 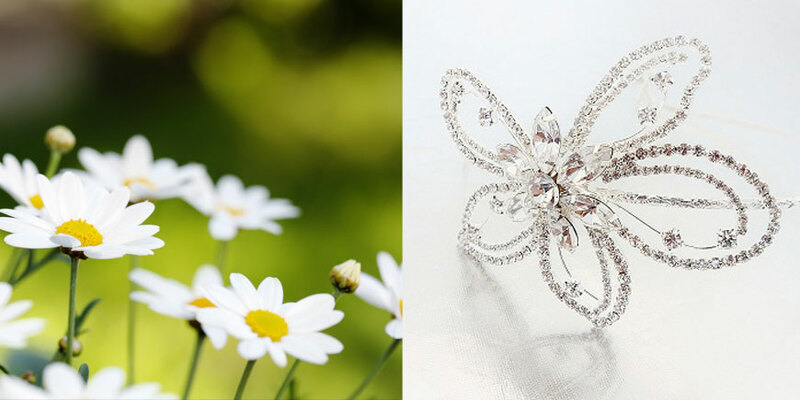 So here at Princess Sparkle we have decided to remind ourselves of some of our favourite summer flowers and to keep it on topic we have picked out some gorgeous accessories inspired by them. Daisies conjure up images of fresh glorious sunny days of our childhood – so what better way to celebrate daisies than by wearing one for your wedding. The anemone is a lovely dainty flower which appears at the very start of spring and as such it often used to represent new beginnings and youth. With this in mind what could be a more appropriate flower to wear on your big day as you start out on your big adventure. The camellia is an elegant bloom and its petals have such beautiful symmetry making it a a perfect example of a flower to be worn by an elegant bride. This entry was posted in Uncategorized, Wedding Hair Accessories. Bookmark the permalink. Win a Wedding Post Box for your big day!